Before the existence of Building the Floridian, we unknowingly started with a lot of brainstorming. We naturally like to talk about homes; we are that couple that drives slowly around neighborhoods to look at the various houses and discuss what we like and don't like and say "that'll be us one day." We must look like creepers when we do that. The months prior to purchasing the lot, we found that walking and running around different neighborhoods allowed us to incorporate maintaining our health and notice more details on each home, plus as a bonus, avoid the creepiness factor. It's a win win win! Anyway, the time spent looking at homes has trained my eyes and brain to pick up subtle details, that as a whole, make the home and property look appealing. It's also enabled me to get a better idea of what I liked and didn't like. This past year, my goal was to get better at identifying my tastes so subscribed to home magazines - HGTV Magazine and Country Living - which has been helpful in generating ideas for inspiration. Pinterest and Google images have been instrumental during the house planning phase. I noticed that searching these websites might require using a variety of words and possibly changing the order of the words to find ideas or provide visuals. It's interesting how "Porches with Columns," "Homes with Porches" and "Homes with Columns" can all turn up different search results, and then even more search results when you change "Homes" with "Houses." High ceilings - 9' or 10' foot ceilings, Chip's not a fan of vaulted ceilings. Low maintenance house and property - My hypothesis...buy the best products and we won't have to spend time replacing or fixing things all the time. That hypothesis will probably yield no theory to my advantage other than the negative. Oh, how a homeowner can dream! A smaller sized home - I want to feel like it's a home we can grow and shrink in as a family (when we have one) and the whole time it feels like the right fit. An open floor plan - I've noticed that people tend to gravitate toward the kitchen but walls can be barriers and we don't want anyone to feel or be isolated. In our home, we want anyone sitting at the dining room table or living room to be included in the kitchen activities and discussions. Chip and I were sitting on the couch - He was playing with his phone and I was checking my email and read a subject line that I just couldn't ignore from Houzz.com (I got sucked into signing up for an email subscription from them) - Of course I can't remember the subject line; never would I have thought it would have been important until now...in this critical moment of story telling! Needless to say, it was about unique ways slides are incorporated into homes. I read the email and after a minute or so said, "If you want a 2 story house, then I want a slide in our home." I was sort of joking but figured what the hell, I'll throw the idea out there. The confusion on Chip's face was apparent, because who naturally thinks of having a slide in their home, but not for long when the realization formed on his face as his opportunity to have a 2 story house arose. He agreed and the matter was settled. 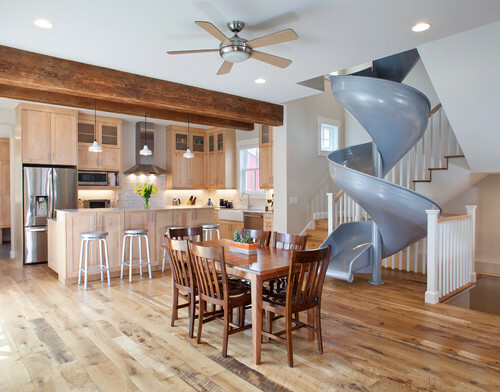 Below is my favorite photo from the Houzz.com email. The slide in this home is one of the many ideas we're using for inspiration. Okay, so why would I suggest a slide in our house when my natural inclination is to worry? Well the pros outweigh the cons - first it provides the most critical reason, it's a compromise. Secondly, it allows me the ability to be 50% more efficient - I can use the slide to transport inanimate objects (such as laundry) as well as myself back to the first floor. Now that I'm typing about this, I realize that some inanimate objects probably won't make it down the entire slide because of the laws of physics. Though, Chip's really good at finding solutions to problems so I have faith he'll figure out a nifty way to make it happen - perhaps a miniature sled - but then I'll have to remember to carry it up the stairs. I sure hope I think the slide is a good idea when we live with it day in and day out. Lastly, and perhaps the most obvious, the slide will provide great entertainment for it's orginal design...to slide down it just for fun. 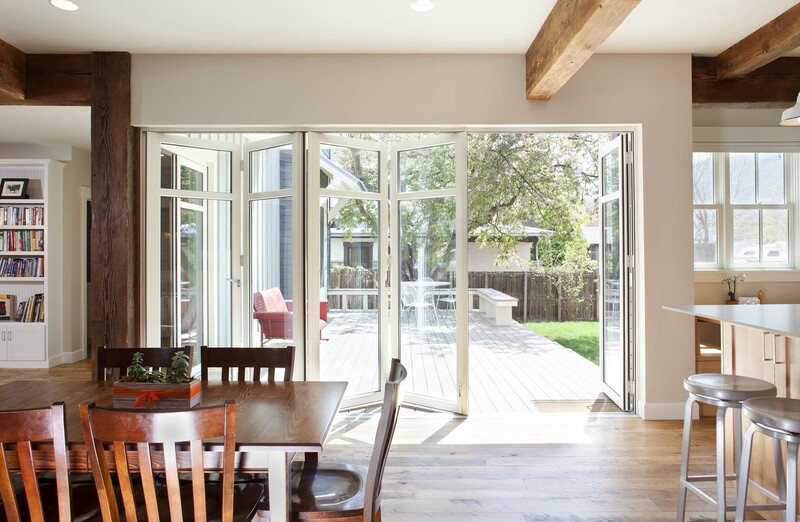 We love the large sliding doors. The large sliders were gorgeous, another photo to save. Unfortunately, my high hopes to fall in love with the entire home was not to be. The home was far too big, I didn't like the exterior facade and hated the built-in booth. The booth seems like a fad, that is super cute but I can't help wonder - what do you do with that space when you don't want a booth in your house anymore? My hope is that each aspect of The Floridian is well thought out and is as practical as possible. Yes, we have totally rationalized the practicality of the slide and that works for us. Since that day back in November 2015, the slide was a big step in getting us closer to what we both wanted in our home. It wasn't until we purchased our property, in July 2016, that we had to get real and honest about which of our ideas were truly must-haves because it was time to get our house plans together. A slide in The Floridian - Do you love it or hate it?